The first of five NATO Global Hawk Unmanned Aerial Vehicles (UAVs) conducted a successful first flight in California on Saturday (19 December). Taking off from Palmdale Airbase, NATO Alliance Ground Surveillance (AGS) UAV aircraft successfully soared to 40,000 feet before landing at Edwards Air Force Base 2.5 hours later. “The NATO-owned and operated AGS Core System will enable the Alliance to perform persistent surveillance over wide areas from high-altitude in any weather conditions. The system will give commanders a comprehensive picture of conditions on the ground,” said Dietmar Thelen, Programme Manager from the NATO Alliance Ground Surveillance Management Agency (NAGSMA). “This is a significant step forward for NATO in ramping up its organic Joint Intelligence, Surveillance and Reconnaissance capabilities”. These NATO Global Hawks will be the first Alliance-owned and operated Aircraft since NATO purchased a number of AWACs aircraft in the early 1980s. NATO is developing its own ground surveillance capability with significant contributions from 15 Allies (Bulgaria, Czech Republic, Denmark, Estonia, Germany, Italy, Latvia, Lithuania, Luxembourg, Norway, Poland, Romania, Slovakia, Slovenia and the United States). The Core System consists of air, ground and support segments. 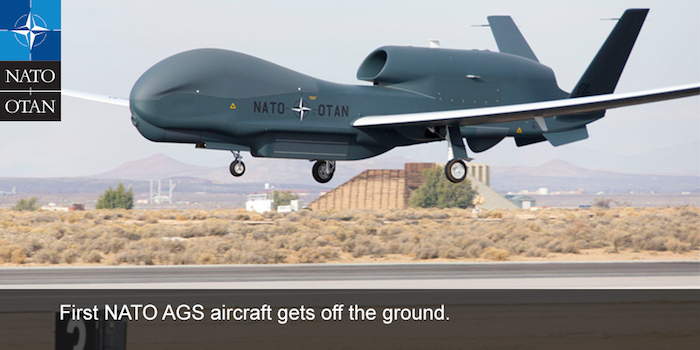 The Unmanned Air Vehicles will be piloted from the AGS main operating base in Sigonella, Italy.